So now, can anyone imagine getting your whole unit wiped out over the killing of a single cow? While I can't imagine it, that's exactly what the Grattan Massacre was all about when it took place on August 19th, 1854, just East of Fort Laramie in the what was then Nebraska Territory. 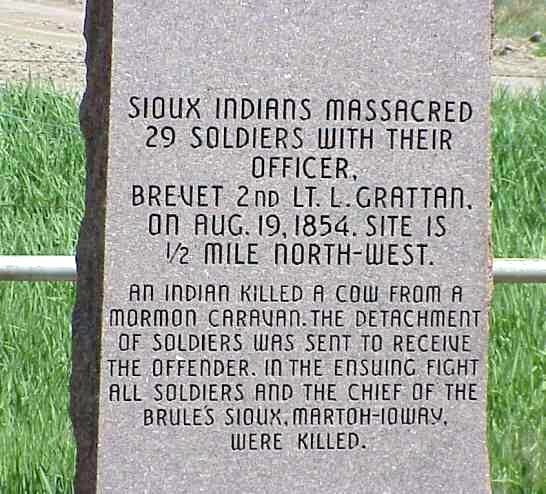 What became known as the Grattan Massacre in 1854 started the First Sioux War. It took place in what is today Goshen County, Wyoming. From the very beginning of the this, the odds were against the U.S. Army Soldiers and their one civilian interpreter. There were 30 Soldiers. There were at least 1,200 Brulé and Oglala Sioux warriors. When the smoke cleared, all of the Soldiers and their civilian interpreter had been slaughtered. And surprisingly, only one Sioux was killed in the clash that took just a few minutes by most accounts. This was the end result of things that spiraled out of control starting in the summer of 1854 when around 4,800 Brulé and Oglala Sioux Indians established a village about 30 miles from Fort Laramie as part of the terms of the Treaty of 1851. The Fort Laramie Treaty of 1851 was signed on September 17th in that year. It was a treaty between United States and the Arapaho, Arikara, Assiniboine, Cheyenne, Crow, Hidatsa, Mandan, Sioux, and nine other Indian nations. In the treaty, the United States acknowledged that all of the lands covered in the treaty were Indian territory. The lands were split up and divided between the tribes, and believe it or not the boundaries that were agreed to in the Treaty of 1851 have actually been used to settle a number of claims since then. Yes, including modern day cases. The treaty was the result of negotiations which the United States government undertook to prevent conflicts with the different tribes. The initial goal was to ensure a right-of-way for Americans traveling West. Among other things, in the treaty, the tribes agreed to guaranteed safe passage to American settlers heading West on the Oregon Trail. Fact is, Americans heading West passed through the Great Plains on the Oregon Trail and the Santa Fe Trail for a long time before 1851. It was actually the California Gold Rush in 1848 that increased the numbers of Americans heading West. That huge increase caused all sorts of problems. Through negotiations with the tribes, the treaty allowed the United States federal government to build roads and even forts in return for an annual payment of $50,000 a year and monthly provisions The reason for the provisions is that game, specifically buffalo, was becoming scarce. As for the funds, initially the treaty called for the annuity to go for 50 years but then was changed to 10 years. Of course, what took place later was that several tribes never received the payments, the provisions, or the commodities on time or as promised. And since there was so many tribes to deal with, all with different languages, it's incredible that the treaty ever took place in the first place. This is even more true since, as you've heard me say in many other articles on wars between the tribes, many of the Indian nations involved in the treaty had waged war against each other long before Whites ever stepped foot on North American soil. For example, it's said that the Arapaho, Arikara, Assiniboine, Cheyenne, Crow, Gros Ventre, Hidatsa, Lakota, Mandan, and Shoshone nations all took part in the treaty discussions. But the Comanche, Kiowa, and Kiowa Apache, had all refused to send representatives to Fort Laramie because the fort was located on Sioux land. Fact is, unlike what you may hear today about how all Native American nations got along, the Comanche, Kiowa, and Kiowa Apache considered the Sioux their enemy. Other problems with the location had to do with the location itself. Besides some of the tribes not wanting to show up for the talks on the land of their enemies, the area around Fort Laramie is said to have lacked forage for the Indians' horses at the time. That meant that the treaty was negotiated and signed 30 miles downriver at the mouth of Horse Creek. That's why many tribes still refer to the "Treaty of 1851" as the "Horse Creek Treaty." As for the treaty lasting, it's said the Treaty of 1851 was broken fairly quickly. No, not by the United States. It was actually the Lakota Sioux and the Cheyenne who attacked the Crow a number of times that same year. Fact is that despite signing the peace treaty of 1851, some tribes refused to respect the peace between tribes. For example, the Hunkpapa Lakota killed four Arikaras in 1853. And again in 1853, the Cheyenne and Lakota joined forces to attack a huge Crow village in the valley of the Little Bighorn River. Yes, right there at the Little Bighorn River where later George Armstrong Custer and the 7th would be slaughtered more than 20 years later. There's an interesting story about how the Cheyenne and the Lakota had a falling out over a Crow woman. The story goes that Lakota Chief One Bear actually killed the Crow woman after she was taken as a slave by the Cheyenne. It's a mystery as to why he killed her. And while that's the case, there are some who speculate that he wanted her for himself. He didn't want the Cheyenne to have her.. The whole situation in that area was really a matter of gasoline and matches. It seemed everyone there was either the gasoline or the match at one time or another as conflicts between the tribes seemed to be a constant. 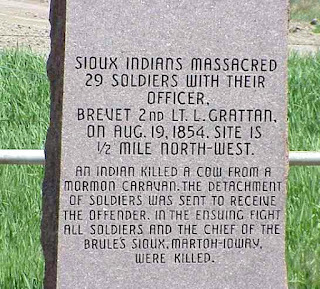 As for the United States, the Grattan Massacre in 1854 started what would come to be known as the First Sioux War. And yes, it was over a cow. The cow belonged to a Danish settler who was a recent convert to the Mormon faith. He lived in the East and decided to go West with a wagon train traveling on the Oregon Trail. Most folks really don't know if his cow was tethered to his wagon and simply came loose or trailed behind the wagon and strayed off. There are those who speculate the Mormon settler simply cut it's line and turned it loose to wander off since the cow said to have been lame and half-blind. The short version of what took place is that some very hungry Indians promptly killed for food when it wandered into their camp. In fact since the Miniconjou Indians were there visiting the Brule while also waiting for provisions per the treaty, a Miniconjou by the name of High Forehead killed the cow and distributed the meat to his starving tribe. a small detachment of Soldiers entered a Sioux village looking for who killed the cow. That's the short version of what happened. As crazy as this sounds, as soon as the word got back to the fort that the treaty had been violated with the killing of that cow, U.S. Army Lieutenant Hugh B. Fleming who was the senior officer at the fort sent for the Brule Sioux Chief Conquering Bear. He wanted to consult the Chief over what took place. Fleming either didn't know or he simply didn't care that such matters were supposed to be taken up, as stated in the Treaty of 1851, by the local Indian Agent and not the Army. At that time, the Indian Agent was John Whitfield. He was in route and was scheduled to arrive within days of the incident. Whitfield was said to be bringing the provisions promised the tribes in accordance to the treaty. Some speculate that Whitfield could have settled the whole thing with very little fuss. But sadly, because of the hasty actions of Second Lieutenant John Lawrence Grattan and his taking the side of a greedy Mormon settler -- that's not how things turned out. In a bit of irony, at the fort Chief Conquering Bear attempted to negotiate with Lt. Fleming even though he was fully aware that the matter did not concern the Army at all. The Chief actually offered the Mormon settler a horse from his personal herd of 60 horses. While this was going on, it became obvious that the Mormon settler was more interested in monetary gain than he was compensation. The cow is said to have been so lame that her hooves were worn through. It's believed that the cow was worth about $4. So yes, that Mormon settler must have been a very greedy individual since he actually demanded up to $40 for his cow instead of simply taking the compensation that was being offered. While some sources say he demanded $25, most others say $40. Either way, that was a lot of money which the Indians did not have. Since Miniconjou Indians were there waiting for their already late provisions from the federal government, they were actually starving. So I'm sure when that cow found her way into their camp, it must have felt like Christmas. Fact is, the Miniconjou were actually there for weeks and provisions had ran out or were terribly low. Even the grass for their horses was thin to none. And frankly, because of the overwhelming number of people there, remember that over 4,800 Indians were at the encampment, any game in the area had already been taken. So yes, they were hungry when they saw that old cow. Sources say Lt. Fleming had at first dismissed the matter. As with most, he probably thought the matter was foolishness. And as for why he entered into the fray over the cow? Well, some sources say that he was actually goaded into acting by Second Lieutenant Grattan. When talking with Chief Conquering Bear at the fort, Lt. Fleming actually insulted Conquering Bear when he demanded that the Chief turn over the Miniconjou Indian who killed the cow. In fact, Fleming demanded that High Forehead be brought back to the fort. Now here's one of those instances in history where you just have to wonder what was someone thinking. What I mean by that is that no one knowns what Fleming or Grattan was going to do to High Forehead after getting him to the fort? That's a mystery. What we do know is that Lt. Grattan goaded Lt. Fleming into insisting on the arrest High Forehead for killing a cow worth $4. Which of course, was a cow that the Mormon could have been compensated for but refused because he wanted to squeeze more money out of the Indians or the Indian Agent or both. Conquering Bear refused Fleming's demand to turn over High Forehead. For one reason, he had no authority over the Miniconjou to do such a thing. Besides, the Miniconjou were actually there as his guests. So with that, the Chief had no intentions of violating their tradition of hospitality over such foolishness as killing a lame cow. Especially when he had already offered to compensate the settler. The day ended with Lt. Fleming very frustrated. The next day, Fleming assigned the job of arresting High Forehead to Lt. Grattan. Second Lieutenant John Lawrence Grattan was a 23 years old recent graduate of West Point. That was his first duty station and he was attached to the 6th Infantry Regiment as an Infantry officer. He is said to have hated Indians for no reason at all. There is something that I was told many years about the Infantry in regards to Native Americans. While I've never thought about trying to verify whether it's true or not, I was once told that most of the tribes had a greater respect for Infantry Soldiers than they did for Cavalry Soldiers. Their reasoning was that, supposedly, Native Americans saw Infantrymen as being braver than Cavalrymen because the Infantry walked into battle to wage war. I gather that was something they believed applied to themselves as well. We have to remember that the tribes waged war against other tribes while on foot for a thousand years or more before the Spanish ever brought horses to North America. So now, all of his goading of Lt. Fleming paid off when he was allowed him to lead a small detachment of soldiers into the Indian village to arrest High Forehead that next morning. But as Lt. Grattan will learn the hard way, one has to watch out what you wish for. Lt. Grattan was authorized a detail of 22 men. Fact is the entire post was only made up of a total of 75 soldiers in all. On that morning, 32 of the soldiers assigned to the fort were off away from the fort on wood and hay cutting details. But even though that was the case, Lt. Grattan took 29 soldiers. That was 7 more than Lt. Fleming had authorized, which of course meant that only 14 soldiers were left at the fort. And since Grattan was looking for a fight, he also took two small cannons with him. I haven't been able to verify what sort of artillery pieces they were. Lt. Grattan led his detail into the village of Chief Conquering Bear to arrest and take into custody High Forehead. Lt. Grattan had with him a Sergeant, a Corporal, 27 Privates, and a very drunk French-Native American civilian interpreter by the name of Lucienne Auguste who is said to have had been drinking all the way to the village. As for his troops, it's said most of the soldiers under Grattan were experienced troops. It was Grattan himself who had no prior experience with the Indians. Of coarse, that didn't matter since he was now leading his small force into a major Sioux encampment filled with young warriors itching for a fight with American troops. Was it all to arrest an Indian for killing a cow? Well, that's the point. I don't believe it was. While I believe it was all about a young officers contempt for all Native Americans, many agree that the killing of the cow was just an excuse for Lt. Grattan to confront the Sioux. Some say it was his opportunity to impose his dominance over those he didn't like. After all, it was known that he treated Indians with contempt. This was even noted later by a senior officer who stated, "There is no doubt that Lt. Grattan left this post with a desire to have a fight with the Indians, and that he had determined to take the man at all hazards." It was only when Lt. Grattan's detail reached the encampment that he noted that Auguste was drunk and obnoxious. At one point Grattan supposedly became so angry with Auguste that he took his booze away from him and smashed the bottle. It was then that Grattan learned that besides being a belligerent drunk, Auguste was also a lousy interpreter. In fact, it's actually questionable whether Auguste knew more than just a few words when it came to the language of the Sioux . There are all sorts of "what ifs" pertaining to this event. For example, what if Lt. Grattan had the experience to know better than to march into a hornet's nest? What if Grattan saw the obsurdity of going to battle over a $4 cow? What if Grattan had later listened to the trading post owner James Bordeau who told him to leave the matter to Conquering Bear and leave? What if Grattan had ordered Auguste back to the fort instead of allowing him to insult the warriors in the camp? The entire village was made up of over 600 Sioux lodges. With a population of some 4,800 Indians, and approximately 1,200 warriors, that was one huge village. Once in there, it's said that some of the more experienced soldiers in Grattan's command quietly voiced their concerns that their tiny force was in a very good position to get slaughtered. It's said that it was only when his Sergeant advised him that leaving the mater be would be advisable at that point, that Lt. Grattan realized the size and scope of the village which he had naively led his men into. While Grattan left 11 men to act as the gun crews for the cannons just outside of the village, he took the remaining 18 troops with him into the village. When his small detail reached about the middle of the village, it's said that painted warriors were making all sorts of hostile gestures to get the troops to start a fight. One report said that young warriors rode their horses aggressively around the small column of 18 soldiers. Lt. Grattan stopped his men and asked the advice of the trading post owner who happened to be in the village at the time. His name was James Bordeau, and he had been at Fort Laramie earlier when the incident happened where Lt. Fleming insulted Conquering Bear. Bordeau was the village trading when Grattan's detail entered the camp. While initially Bordeau didn't know that Grattan actually intended on arresting High Forehead, he watched the entire event take place. In fact, most if not all of what we know that went on in the village is from Bordeau. He later stated that Auguste, the translator, was drunk and yelling at the Indians. Auguste was telling the village that Lt. Grattan and his troops had come to kill them all. Auguste was calling the Sioux warriors "women" while riding drunkenly around those there saying they had come to fight and not to talk. While this was going on, Grattan asked Bordeau for his advice regarding how to solve the matter without bloodshed? Bordeau supposedly told Grattan to talk with Conquering Bear, and let him handle it in his own time and leave as fast as possible. Bordeau later said that he was surprised when Gratten wanted to push the matter. So instead of pulling his troops back, Lt. Grattan led them deeper into the village until he came face to face with Miniconjou High Forehead. Whether Grattan was extremely brave or very dumb could be debated. We do know that instead of taking the advice of Bordeau, Grattan unwisely decided to order High Forehead to surrender to him and return to the fort with him. Yes, he did this with 29 troops and a drunken interpreter in the middle of a village surrounded by well over a thousand warriors. Grattan's bravery to do this in the middle of 1,200 warriors wanting a piece of his scalp didn't impress High Forehead. He turned his order to surrender around and actually challenged Lt. Grattan to fight him man to man. He also told Grattan that he would rather die than surrender to him and be taken to the fort to die. High Forehead's anger over this was seen as reasonable throughout the camp since all there knew that soldiers killed two Miniconjou just two weeks earlier, and certainly didn't give it as much attention as the soldiers were now giving the killing of a cow. High Forehead's deviance is said to have angered Grattan a great deal. But obviously, it was not enough to fight High Forehead man to man. Because instead of addressing High Forehead, Grattan turned away from High Forehead to speak with Conquering Bear and accuse him of harboring a criminal. At that point Conquering Bear asked to get James Bordeau to translate for them since Auguste was drunk and couldn't be trusted. An Indian leader by the name of Man-Afraid-Of-His-Horse retrieved Bordeau. But when Bordeau arrived and saw the tension between Lt. Grattan and Conquering Bear was about to boil over into violence, Bordeau decided to turn back. There are a few conflicting reports as to what happen next, but this is what I've learned about this. At some point, it is believe that Lt. Grattan decided to order his two artillery pieces turned toward the village. That was not a wise move because as soon as he did, his orders brought hundreds of warriors out to immediately surround all of the soldiers. Yes, both the 11 soldiers at the cannons and the 18 with Lt. Grattan. Among those there was a young warrior by the name of Red Cloud. He would later become famous in his own right. On that day he led warriors around to flank the soldiers. Bordeau rethinking the situation and deciding to go and see what he could do to stop the potential violence, again decided to go and act as a translator. But when he was about 25 yards away, he was cut off by Red Cloud's flanking movement. He was helpless to help so all he could do was watch as a heated exchange between Lt. Grattan and Conquering Bear took place. After watching what was taking place, Bordeau again retreated. But this time Bordeau returned to his trading post where he told all of the traders there to load their weapons because the fighting was about to start. So now, Lt. Grattan and Conquering Bear are arguing. Then Grattan decides that he isn't making progress so he turns to walk back to his troops apparently intending on leaving. At the same time, Conquering Bear turned away and starts walking away heading toward his lodge. But before Lt. Grattan reached his troops, the story goes that a nervous soldier's rifle went off. Some sources say he fired into some approaching warriors. Fact is that soldier actually shot Conquering Bear in the back and he died nine days later near the Niobrara River. So if it was an accidental discharge, how is it that the trooper's bullet struck Conquering Bear in the back and not someone else since there were so many others around them at the time? Fact is, some sources report that Lt. Grattan actually ordered his troops to open fire while moving toward his artillery pieces. The first to fall was the 11 men of Grattan's gun crews after being hit by a tremendous volley of arrows. Lt. Grattan was near his cannon placement when he was also struck down by the raining arrows. The 18 soldiers left at that point band together to try to make it to a rocky area for defense. Running to the rocks on foot to make a stand, they never made it. As they had to cross a part of the open prairie to get there, Red Cloud's warriors rode them down and quickly overwhelmed them. Surprisingly, all my one was killed. That one soldier had initially survived the massacre but later died as a result of his wounds. It's said that the warriors "rampaged throughout the night, swearing to attack other whites" that night. And in reality, they did ride against Fort Laramie the next morning. Luckily for the fort, they overwhelming number of Indians didn't push it and simply withdrew. As for James Bordeau who owned a nearby trading post, he watched the whole thing take place. He was a key eyewitness later when the Army wanted to know what took place that day on August 19th, 1854. It's believed that the only reason that Bordeau was spared was because he said to have been married to a Sioux woman. Of course, he being friends with all of the tribes didn't hurt his chances for survival as well. But then again, that didn't stop the warriors from looting his trading post that night. Three days after what the American Press dubbed the "Grattan Massacre," the Brule and Oglala abandoned their village on the North Platte River and returned to their respective lands set up by the treaty. While Grattan was returned to the post for burial. The remains of the troops were buried on the spot where they were killed in a mass grave. Yes, all 28 men in the same shallow grave. They were later exhumed and reburied at Fort McPherson in what would later become a National Cemetery. Today there is a white marble monument erected there in their memory. Second Lt. Grattan is buried in Fort Leavenworth, Kansas. His remains were moved later to Fort Leavenworth in what would later become a National Cemetery. There is a historical marker about a half mile from where it all took place. In the American newspapers, accounts conveniently ignored many of the facts of what took place. There were no mention of how American soldiers instigated the end result by shooting Conquering Bear in the back. There was never a mention how Lt. Grattan violated the treaty by entering the village. Of course, this was the event that many in the U.S. War Department were looking for to justify attacking the Plains Indians. Officially it was "retaliation" to punish the Sioux. Many believe it was the opportunity that many in Washington D.C. was looking for to control of lands that were Sioux territory. Either way, the Army immediately placed the blame for the Grattan Massacre on the Lakota Sioux. And the tragic event, began a series of wars between the Plains Indian nations and United States that would go on for the next 25 years or more. So now imagine if you would, the event that triggered the warfare and death of both Native Americans and American troops was the killing of an old lame cow worth about $4. Yes indeed. Imagine that. Elizabeth L. Johnson said, Tom, now that was a story and a half! A good read; thanks! I enjoy your column very much. It's history, and I bet you get the facts pretty straight; after a lot of research! Thanks for all the work, that I don't have to do! How Can The FBI Be Trusted? Shop Amazon Gift Cards. Any Occasion. No Expiration. It's what we are asked to do. About me? Well I'm married, and my wife and I live in California, in a small town with a population of about 200 nestled in the central Sierra Nevada Mountains. I'm originally from Hawaii, of Portuguese ancestry, retired, a former U.S. Marine, old fashion, Catholic, very Conservative, and not Politically Correct. As for being a Cowboy? Yes, you can thank my Grandpa for my Cowboy ways. The years I spent growing up on my grandfather's ranch in Kunia on Oahu in Hawaii helped make me who I am. As for my writing style? I'm an informal writer. You'll find I write the same as if we were talking over a cup of coffee. Why write this blog? Well, my wife and I believe we should celebrate and defend our American culture, values, heritage, our country lifestyle, and all that makes us proud Americans. Like others, we live simple and work hard to make ends meet while thanking God for our blessings. Basically we're just your neighbors with opinions, stories, and information. Thanks for stopping in.